I have discovered the world’s best bacon. Chef John Besh, recently introduced me to Allan Benton’s bacon. Besh was introduced to the product through Chef John Fleer of Blackberry Farm in the foothills of the Smoky Mountains, not too far from the smokehouse where Allan Benton does his magic. Benton has been curing hams, bacon, and prosciutto for 33 years, though the business has been in operation in Madisonville, Tenn. for almost 60 years. Madisonville is located a few miles off of I-75 between Chattanooga and Knoxville and from this day forward will be known to me as the center of the porcine universe. In 1947, a dairy farmer named Albert Hicks began curing hams and making bacon for his neighbors. In 1973, Benton, a former high school guidance counselor, purchased the business, and luckily for us, has been smoking and curing pork using the tried and true methods passed down from generations of Smoky Mountain farmers ever since. The country’s taste buds are waking up from a decade’s long dry spell. The heirloom vegetable movement is taking hold and the general public is beginning to recognize the impact of individual flavor on a dish. Today’s mass marketed tomatoes have been genetically altered over the years to have thicker skins so they will ship well, redder color so they will have more eye appeal, and grown to be picked early and ripened in a box on the way to the market, sacrificing taste at every alteration. Bacon is the same. Mass produced commercial pork bellies are injected with brine in the packing house, flash-smoked in a smoke room, and— 24 hours later— are being packaged and shipped. It’s quick, it’s easy, it’s profitable, and the result tastes nothing like bacon did years ago. The Allan Benton process for curing and smoking bacon takes time— a minimum of five weeks. First Benton mixes together a dry-rub blend of salt and brown sugar, rubs the pork bellies and stacks them in a 38-degree cooler for two weeks. Next he transfers the bellies to another cooler where they hang in a 45-degree environment for a week and a half. They are then moved to an aging room for two more weeks before they are taken to Benton’s smokehouse where they spend 48 hours in an intense billowing fog of thick hickory smoke. “You wouldn’t believe how much smoke you can generate out of an old wood burning stove,” Benton says. I believe it because I have eaten the end result. In the past few years Benton’s bacon has found a home in some of the finest restaurant kitchens from New York to Napa. 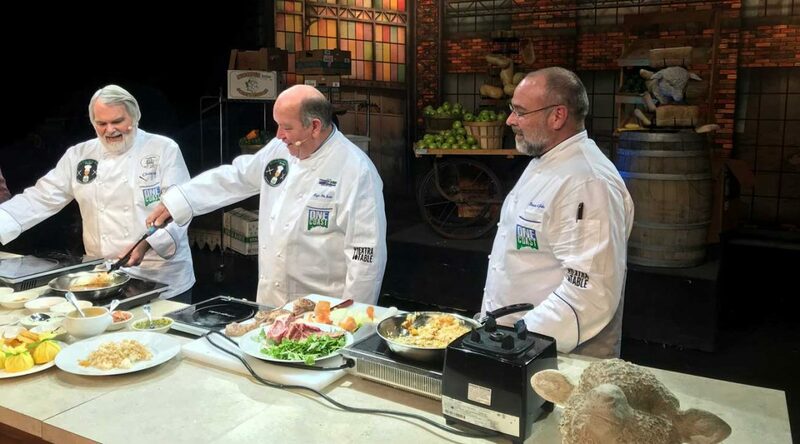 “For years I thought I would starve,” Benton says, as he gives credit to Chef Fleer for introducing his product to top chefs around the country. The operation is still small by most standards. Benton cures approximately 12,000 hams per year, smokes around 3,500 pounds of bacon each week, and produces a prosciutto that will rival any produced in Parma, Italy. The prosciutto is cured for 14-16 months and on occasion 18-22 months. “I like to cut the prosciutto into 1 /8 th inch strips and eat in on a sandwich,” Benton says. He makes sausage, but doesn’t ship it retail like the bacon, ham, and prosciutto. I ordered bacon and ham last week and am going to have to place another order soon; it’s so good that I keep giving it away to my friends. Benton ships anywhere in the U.S. and the bacon keeps for up to four months in the refrigerator. Benton’s Smoky Mountain Country Hams: 423-442-5003 www.bentonshams.com .